Today, CFBA is introducing Ashton Park by Murray Pura. Among the green hills and trees of Lancashire, only a few miles from the sea, lies the beautiful and ancient estate of Ashton Park. The year is 1916. The First World War has engulfed Europe and Sir William's and Lady Elizabeth's three sons are all in uniform--and their four daughters are involved in various pursuits of the heart and soul. I was looking forward to reading Ashton Park, but I struggled with the rapidly changing scenes between too many characters. I never had a chance to connect with any of them in such short spurts. My favorites were Libby and Michael, but they aren’t even introduced until almost halfway through the book...and like everyone else, only a few paragraphs are written before the focus is moved to someone else, and you hope to catch another quick glimpse of them before moving on again. Apparently, those who love PBS’ Downton Abbey will love Ashton Park. 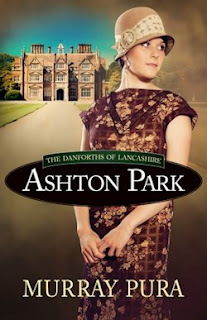 I can’t confirm that, as I’ve never seen it; but, if Downton Abbey is soap opera-ish with high drama and a million characters to keep track of, then, yes - Ashton Park might be just for you. For me, though, I’d prefer a longer series, focusing on less characters per book. Unfortunately, Ashton Park just wasn’t my cup of tea. Victoria Danforth leaned into her horse’s neck as it broke out of the forest and drove toward the sea cliff at full gallop. A green ribbon flew from Victoria’s head and her long auburn hair burst loose. She struck the sorrel’s flanks with the heels of her black leather boots. The shining sea drew closer and closer. A wind that carried the bite of salt water stung Victoria’s nostrils. Face flushed by the wild ride, eyes glittering like a cat’s, she cried out a final time. And then she hauled back on the reins, turned the mare’s head to the left, sprang from the saddle, and hit the ground boots-first with a shout. The horse dug in all its hooves and tossed up mud and stone and grass. The cliff edge was only a few yards away when she stopped. The brisk ocean breeze pushed back the auburn hair from Victoria’s face, bringing its deep red color out to the light, then turning it over and bringing back its rich browns. It plucked at her forest green riding coat, her white blouse, and the green silk scarf at her throat. The scarf brought out the emerald fire in her eyes. “Miss Victoria,” came a man’s voice. She had closed her eyes to better dream of sailing on a ship across the Atlantic to America or Canada. There is land no white man has ever seen, her brother Edward the naval officer had told her once. Mountains where no man or woman has ever placed a foot. Animals that are the stuff of dreams. “Miss Victoria.” The voice was more insistent. She leaned forward and whistled softly in her mare’s ear. The horse bolted forward, away from the sea cliff and down the path leading back into the forest of tall ash trees. Todd rolled his eyes and muttered, “Ah, dear Lord,” and dug his heels into his gelding’s sides, urging it after the mare. He knew he would never catch Victoria but at least he could keep her in sight. The soaring ash trees, some two hundred feet high and hundreds of years old, flashed past on either side of Victoria as she and Robin hurtled along the track. She meant to get altogether out of sight of Todd Turpin, who, she was certain, reported to her mother all her goings-on, despite his protests to the contrary. Bending over the mare’s neck, she took a different path and galloped full out over a trail she could have ridden with her eyes closed. It was a shortcut she was certain Todd had never used. Sure enough, she erupted from the ash trees five minutes before a wor- ried Todd emerged flustered from the main road through the grove. He saw her riding her mare slowly over the large green lawn that surrounded the manor house and called out to her. She rode Robin toward the great house with its stone walls and tower- ing brick chimneys and hundreds of windows. Ivy grew green and lush over the entire back of the manor, the oldest part, completed in 1688. The newer wings, dating from the mid-1700s, were clear of growth and the stone shone, in some parts, a soft gray like pigeons, in other parts, a warm honey color, and in still other places, a ruby red that made her think of strawberries. She urged her mare onto the scores of flagstones that rimmed the house, and the horse’s hooves clicked and clacked as Victoria guided her to the front of the ancient and sturdy manor. There were a hundred and sixteen rooms and Victoria had been into most of them at least twice, including the ones her mother had locked up tight. A cluster of starlings burst from the trees and darted over her head, making the horse rear, nearly throwing her off. “Shhh, my lovely,” she said, quieting the mare, tugging slightly on the reins. “It’s all right.” She stared after the birds as they raced for the far corner of the manor. “Now what was that all about? Do you suppose they’ve seen hawks?” She glanced at the scores of windows. “Perhaps they saw a ghost. Old Todd Turpin always frightened me half to death with his stories of headless phantoms and Viking raiders swinging swords running with blood. The worst was the woman who burned to death when a candle set her gown on fire.” The horse nickered and Victoria patted her neck. “That really happened. That’s the trouble. A bride going up like a torch and no one could get her gown or corset off. The groom tried so hard and his hands were scarred forever from the flames. He never married again. She was a Danforth.” Victoria shuddered. “Why did I have to start thinking about that gruesome event? Servants say they’ve seen her burning and screaming in the room where it happened. One butler quit over it.” Robin nickered again. The sun had been in and out of the clouds all afternoon. Now a light shower fell softly on Ashton Park and its stone and ivy and grass. It glistened on Victoria’s green sleeves and beaded on Robin’s mane. The oak trees that grew around the old castle that was hundreds of yards away, its turrets just peeking above the treetops, glistened in the fall of the drops. Victoria rode the mare over the front lawn to the drive and then toward the broad avenue through the gnarled and sweeping oaks, where she knew her father’s coach would soon come. As Victoria watched, the sun slipped back out and the oak forest and castle and avenue caught fire. The beauty of the moment overwhelmed her. Then into the flame of leaves and bending tree trunks, like a moving photograph, a black coach suddenly appeared pulled by two nut-brown horses in harness. Robin threw up her head and gave a short whinny. She rode up to the coach as it slowed, its driver cloaked in black with a top hat and scarf. He lifted the hat to her. Thank you to Murray and Harvest House through CFBA for sending me a copy to read and review!